FREE SHIPPING: April 21st-25th and RETIRING PRODUCTS WHILE SUPPLIES LAST!!! or the Retiring category on the left sidebar, to SHOP NOW. NEW TO THE RETIRING LIST THIS YEAR: in case you didn't catch it up above, ALL Retiring products will only be available while supplies last, including stamps. 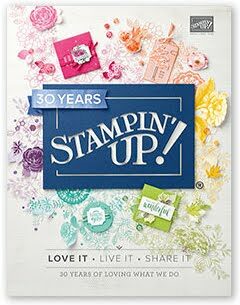 In previous years, Stampin' Up! has continued to produce stamp sets until the final ordering day of the catalog, so don't be caught off guard with that same expectation this year. Once a stamp set, or any item on the Retiring List is gone, it's gone for good. RETIRING LIST ORDERING TIPS: Check the Retiring List files at the links above, there are markings in the files which will indicate a couple of conditions that may affect your decisions on certain products. For instance, an item marked with one asterisk (*) on the Accessories List, will show up in the new catalog, but in a reconfigured format. If you like the format it's available in now, get it while you can! Also, an item marked with two asterisks (**) on the Accessories List, indicates a BUNDLE of products that includes some items which will NOT be retiring. You'll want to check against the rest of the Retiring Lists to see whether the part of the BUNDLE you want, will be retired or not. Thinking you might want to Become a Demonstrator? Now is a fantastic time! Not only will you get to choose $125 in product for only $99 in your Starter Kit, you will also qualify for a FREE Convention Registration ($300 value), and you will always get at least a 20% discount on orders you place as a demonstrator. It's always great to get quality product you love, for less! Do you suffer from Craftitis Non-Interruptus? I think I do. This is what happens when I get back to crafting after I've been away, unfortunately mostly due to being ill. I get so excited to look at ALL of the samples I've missed online, and to make new things, and I stay in my PJ's all day. And while I'm engrossed in my come back, I need to get up and pee, but I put it off; I need to eat and drink, but that can wait til my next stopping point (unless I have candies lying around). Suddenly I've made myself ill again, from a condition I have decided to call: Craftitis Non-Interruptus. I know I need to stop acting like a 5-year old at recess, but knowing and doing are two different things. This is why I will be presenting prior projects for your last-minute Easter crafting enjoyment, instead of posting new ones! Sorry, I'll grow up soon--the first step is admitting you have a problem, right?!? 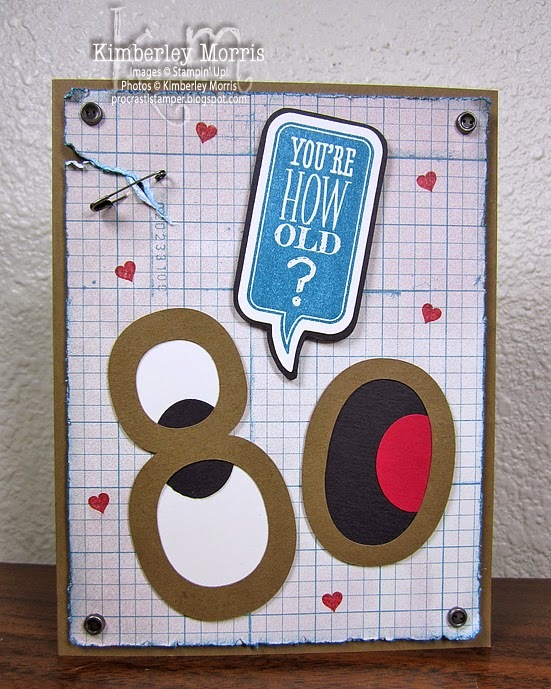 So, how often do you get to make an 80th birthday card? This one is my first! It is also my very first attempt at using an electronic cutter (Eclips 2). I basically picked a font on my computer and typed '8' and '0', and then told the machine to cut it out. In the process of doing that, I realized that the number 80 when rotated 90 degrees, makes a gasping face! I thought my creation was terribly clever, but this is coming from a person who finds puns witty, so I realize that my judgment may be deeply clouded. I tried to make the card look a little "aged", by distressing the edges, and even ripping a piece back and using a safety pin to hold it together. The hearts served two purposes: 1) they help to tie in the red color of the "mouth", and 2) they indicate this jest is meant in FUN. The card was for my...wait, this needs back story. My sweetie and I are not technically/formally married, but Colorado is a Common Law Marriage State. I tried introducing my sweetie as my "partner", and was constantly asked about my law firm, job as a police officer, or just got that, "Does she mean lesbian lover?" raised eyebrow. Doesn't help that my sweetie's name is Blake--could go either way with that! My favorite relationship status label for us is: Living in Sin. I know, there's that questionable judgment again, but I find that term more and more hilarious the older I get. So, the birthday card was for my Father-in-Law-in-Sin ;-) And he must have known I was trying to be clever, because the card elicited a chuckle and head shake. We'll just go ahead and call that appreciation! Stampin' Supplies: Just Sayin' stamp set (wood-mount or clear-mount), Word Bubbles Framelits 132968 (or get the two at 15% off in a BUNDLE), Soft Suede card stock 115318, Very Vanilla card stock 101650, Basic Black card stock 121045, Raspberry Ripple card stock 126842 and ink pad 126859, Island Indigo ink pad 126986, Soho Subway Designer Series Paper 130140, Vintage Trinkets 118764 (safety pin and brads), Stampin' Sponge 101610, Stampin' Distress Tool 127562, Tombow Multi Glue 110755 (to assemble numbers/face), Mini Glue Dots 103683 (to adhere numbers), Stampin' Dimensionals 104430 (to adhere top layer of card to base), Paper Snips 103579, Stampin' Trimmer 126889. Non-SU! Supplies: eclips 2 & eCAL software. IMPORTANT ECLIPS 2 NOTE: I wish someone had told me this before I spent over two hours trying to figure out why my machine would not connect over USB. Here's the trick...in your eCAL software (at least in the full version), you need to go to the Cutter dropdown menu, scroll down to My Cutter, and pick Sizzix eclips 2. The software apparently does not automatically recognize the Eclips 2, at least not on my Windows XP64 computer. Once I figured that out, it was smooth sailing. 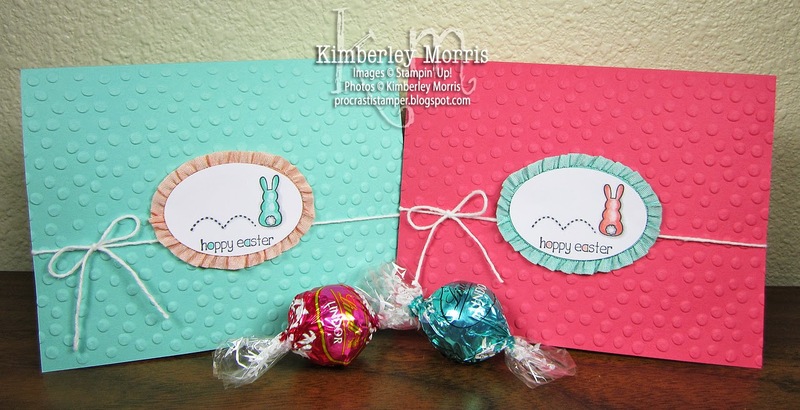 I used the Eggstra Spectacular stamp set, and I will admit that I kinda "cheated" a little bit. You see, Stampin' Up! is coming out with its own line of alcohol markers soon, called Blendabilities...but, I don't have them yet. 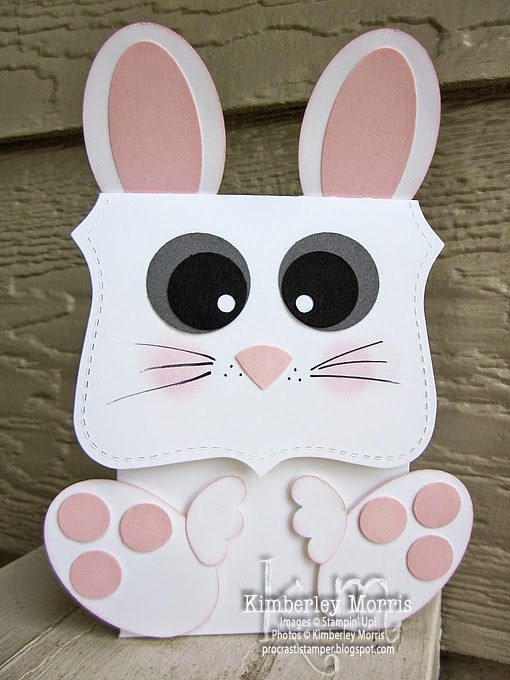 So, I used some other alcohol markers to color in my bunnies :-) And, I used an embossing folder that you can't get right now--but you may have chosen it as a free Sale-a-Bration item. But, that's okay, too, because you will be able to order the Decorative Dots Embossing Folder when the NEW 2014-2015 Annual Catalog debuts on June 2nd at Noon MT! 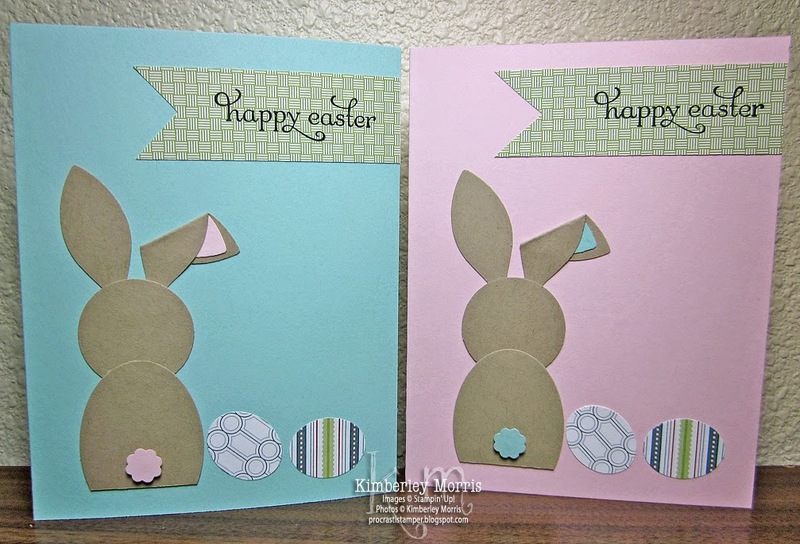 The cards could have been perfect opposites of each other, but the Coastal Cabana one is for a guy, and I thought using Strawberry Slush ribbon around the bunny was just too feminine. So, I used Crisp Cantaloupe instead. Wondering how I trimmed those XL Oval Punches with ribbon? Easy, I just laid down a line of Sticky Strip along the back outer edge, removed the red liner, and stuck the ribbon down to it. 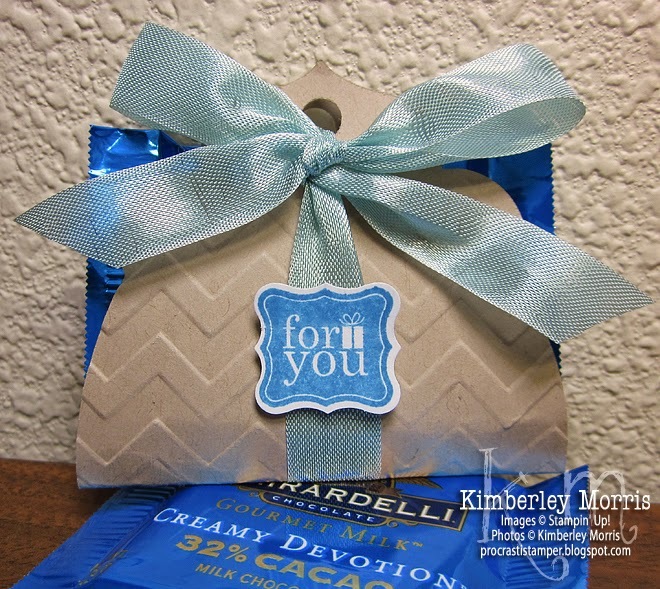 The ribbon comes already ruffled for you, straight from the package! 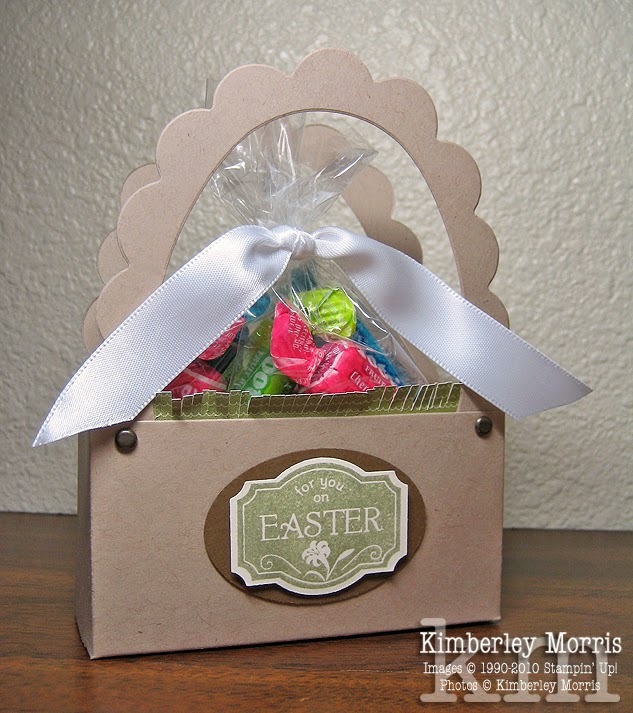 I added the ruffled oval to the card front using a couple of Stampin' Dimensionals, then wrapped around and tied a bow with Whisper White Baker's Twine. If you'd like to stay in the loop regarding the Blendabilities alcohol markers, NEW 2014-2015 Annual Catalog, and all other things Stampin' Up!, be sure to Subscribe to My Blog for EMAIL UPDATES. 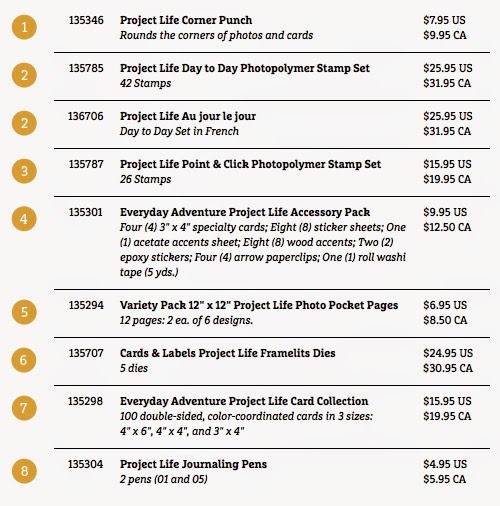 Demonstrators will get to preorder select Project Life products on April 21st, but those products won't be available for retail (customer) purchase until May 1st. 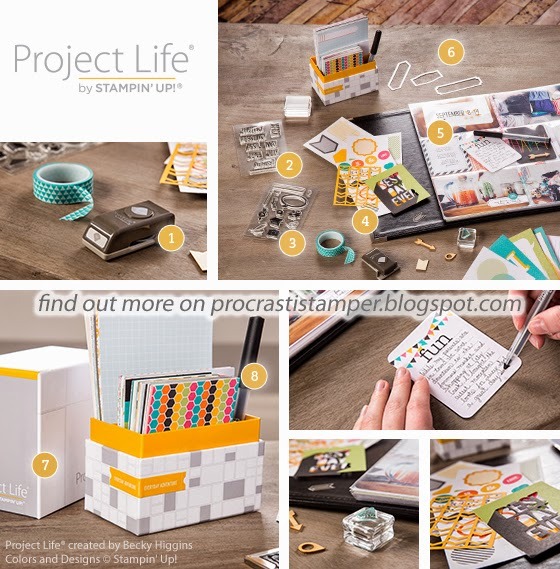 So, if you would like to get your Project Life by Stampin' Up! products ASAP, and enjoy a demonstrator 20% discount on it, I would L♥VE to have you on my team, just click on this link to Become a Demonstrator! If you'd like to find out more about the new Project Life product line, visit http://www.stampinup.com/projectlife (please be patient as this link is populated) and be sure to Subscribe to My Blog for EMAIL UPDATES. Hooray for Today - SUN! Thanks for hanging in there with my posting inconsistencies this year. If you are new to my blog and are curious, you can click here to see the stuff that started with me way back in mid-December 2013. Then, in early March, I had a relapse of a condition you can read about here. I am happy to report that I am no longer in that horrific pain. So, even though it's not bright, clear, and sunny in Colorado Springs this morning (we got snow again! ), you can see why I can still say, "Hooray for today!" This card features the Geometrical Stamp Set + Triangle Punch Bundle, and our NEW Fringe Scissors. You can purchase the stamp set and the punch individually, but you get a 15% discount when you purchase the Bundle! It is pretty easy to recreate this card from the supply list below, but I do have a few tricks for you that I'd love to share. A video would be the easiest way for me to do that, but I don't want to promise that because I have so much catching up, cleaning, and reorganizing to do. So, I guess I will type up some instructions to walk you through this card for now. Feel free to comment on this post with any questions you may have. 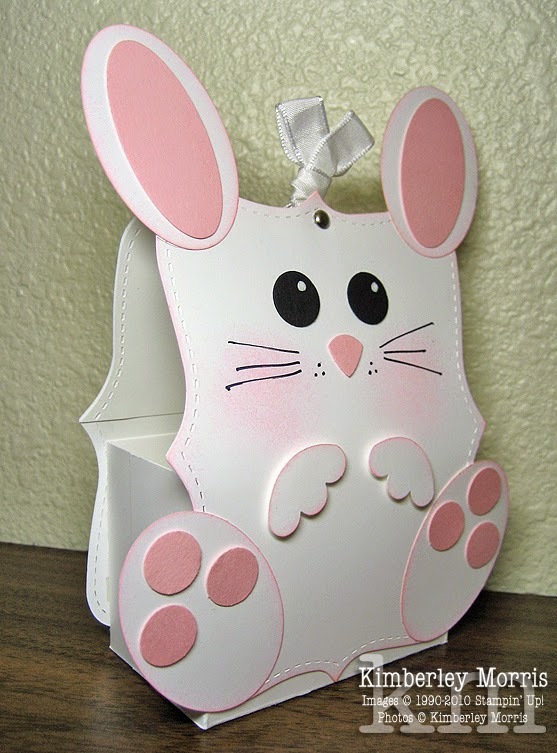 1) Cut Whisper White card stock to 5-1/2"x8-1/2" and score in half to make a 4-1/4"x5-1/2" foldover card. 2) Sponge Soft Sky ink over the edge of a scallop circle*, then move scallops and repeat as necessary to fill front of card. 3) Punch a 2-1/2" circle from Tangerine Tango card stock, and stamp saying in Tangerine Tango in center of circle, as shown. 4) Stamp 8 striped triangles in Tangerine Tango ink, and punch out with Triangle Punch. 5) Cut a strip of Pistachio Pudding card stock to a 4-1/4" width, and at a height you'd like your grass. It's only Spring so I wanted the grass to be muted, but you could use Gumball Green for more luxurious grass. 6) Cut "grass" strip with Fringe Scissors, being careful not to cut all the way through the strip, and being careful not to snip your fingers. To make my grass a little less stiff and straight, I cut across the top of the fringe at a slight angle with the Fringe Scissors, then went back and did the same in the opposite direction. 7) Adhere your grass strip to the card front with Tombow Liquid Adhesive (glue). 8) LAY OUT YOUR CIRCLE AND TRIANGLES on the card front to plan where you want to adhere them. 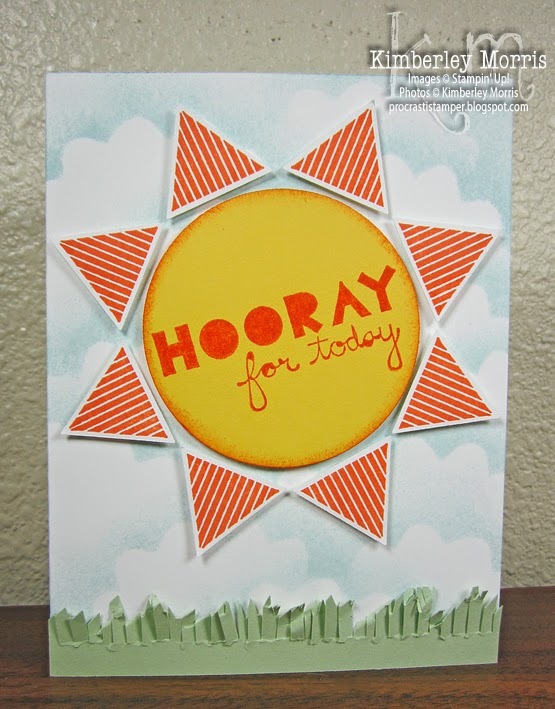 You can get the sun and rays to easily fit within the card front if you arrange them as shown on my sample. 9) Pick up the 2-1/2" circle, and adhere back in place with Stampin' Dimensionals. 10) Pick up one triangle at a time and adhere it back in place with 1/2 Stampin' Dimensional on the back. 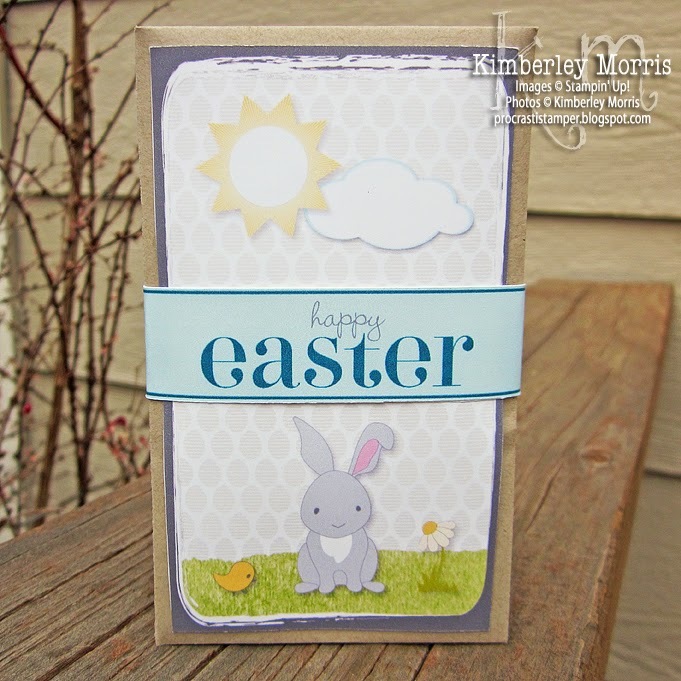 11) Consider sponging clouds on the flap of an envelope, to coordinate with this card. *TIP: If you do not have a scallop circle punch/shape you can use, consider punching out a 2-1/2" circle and cutting your own scallops along the edge. Because it's for clouds, the scallops don't have to be perfect, and you only have to do it once to get a reusable template. Stampin' Supplies: Geometrical Stamp Set + Triangle Punch Bundle (wood-mount or clear-mount), Whisper White card stock, Pistachio Pudding card stock, Fringe Scissors, Tangerine Tango card stock and ink pad, Soft Sky ink pad, 2-1/2" Circle Punch, Stamping Sponges, Stampin' Dimensionals, Tombow Multipurpose Liquid Glue (to adhere the grass), Stampin' Trimmer (to cut and score card), Whisper White Medium Envelopes.